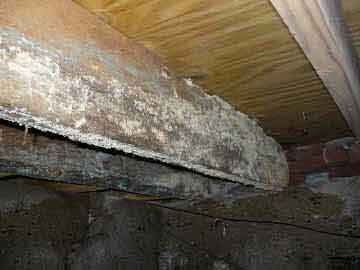 Dry rot and woodworm are caused by the same problem, namely wood getting damp. If you think it is ironic that dry rot can only strike when wood is wet then you are not alone. The term came about when it was thought that this sort of rot, brown rot, occurred without any moisture being necessary. However, it was later found to be a fungus, needing water in able to survive and grow. 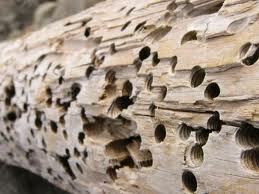 Woodworm also looks for moist wood, as that is what they evolved to live on, wet wood in nature. 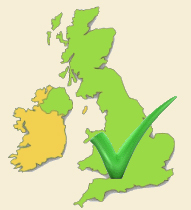 We have treated over 15,000 dry rot cases in the UK. Request a quotation now. If you do have dry rot then the woodworm will be a secondary consideration. Dry rot seriously affects the structure of wood and if you have it in your house you should seek immediate treatment so that it does not spread and cause massive structural failure. Woodworm, however, can also cause structural failure in severe cases. Woodworm does not attack wood in conditions where the humidity is below a certain level, providing of course that the wood is not getting wet. There may be a leak somewhere which is causing the wood to get wet, but barring that possibility, as long as the moisture in the air is not too high, you should not get woodworm. Or dry rot for that matter. If you do notice signs of woodworm, however, then it means you could also have a dry rot problem, although the two are not inextricably linked. Nevertheless, it is best to have a professional check it out. They will be able to survey the whole house and be able to identify woodworm or dry rot, much of which, if it is there, will be out of sight. There are various treatments for dry rot, but only professionals will have the proper chemicals to take care of it. The same goes for woodworm, which can be just as much of a problem in some cases. To prevent dry rot however, you could try using antifreeze, which will also kill the fungus. However if the fungus has spread, it might not get it all. Painting or varnishing wood is enough to prevent woodworm, although this is not possible for floorboards and you may not want to do this in the attic either. Whether you are trying to prevent woodworm, dry rot (or wet rot for that matter) the solution is the same, keeping your wood dry. Woodworm does not require the same amount of moisture in the wood that dry rot does. Dry rot usually needs a source of actual water rather than just moisture in order to take hold. If you keep your timber nice and dry however, then there will be no possibility of dry rot or woodworm taking hold. In the event that you do have either dry rot or woodworm, then you should certainly seek professional help. Request a quotation to determine whether you have dry rot.